What Are The Benefits Of Having Two Dogs? 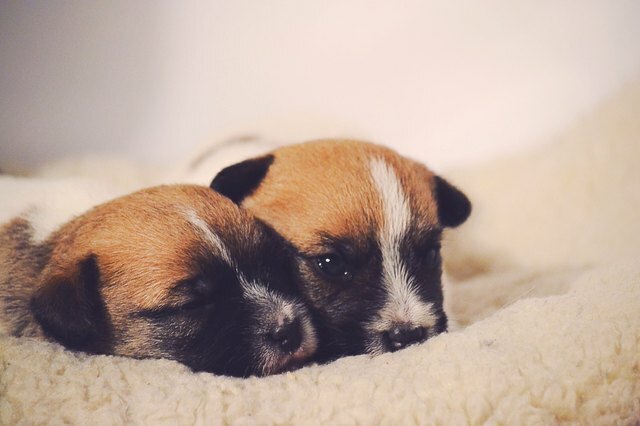 Are there benefits to having two pooches? When you're not home and can't provide entertainment for your pooch, another dog in the household can be a comfort. It also can often prevent boredom and resulting behavioral issues. Although owning multiple dogs can work well for some households, it's not suitable in all situations. If you have a busy work schedule and spend a lot of time out of the home, having two dogs can help your peace of mind. Your dogs can play with each other, which can be effective for keeping boredom and lack of stimulation at bay. Boredom and inadequate stimulation can trigger destructive canine behaviors such as chewing, pacing, digging and excessive barking. Not only can constant companionship help prevent behavioral troubles, but it can help to eliminate or minimize separation anxiety. Being a guardian to two dogs also can be advantageous from a socialization standpoint, particularly in the cases of younger animals. Socialization can be excellent for their emotional development. When dogs spend a lot of time around each other, it can help them learn how to deal with other animals and humans. If one of your dogs is insecure and lacks confidence, having another dog around who is the polar opposite can be helpful. A self-assured dog can be a positive role model for one who is anxious, high-strung and fearful in temperament. It's important to note, however, that two dogs who display similarly anxious temperaments can reinforce negative behaviors in the other. This also goes for aggression. If one of your pets is aggressive, it could encourage the other to act in the same way. Two dogs means increased companionship for them. It also means more for you. Animals can be sources of comfort for people. If you've had a tough day and feel grumpy, tired and cynical, your dogs can help you relax and forget your problems. You can cuddle, pet them, play fetch and feel better. Having dogs can be beneficial for your health minimizing stress, reducing your chances of getting a stroke or heart attack and decreasing your cholesterol and blood pressure. Multiple dogs also can encourage socialization in owners. If you own two dogs, you have to go outside to take them out for walks more frequently -- dogs benefit from solo outings. This gives you more chances to interact and communicate with other people regularly. The more you visit pet grooming salons, pet obedience training classes and veterinary clinics, the higher the odds of your encountering new faces who are just as passionate about their dogs are you are. While owning multiple dogs can have its benefits, it also can have its drawbacks. It can be costly to own one dog, with food costs and veterinary bills. Owning multiple dogs takes that to the next level. If your dogs have destructive tendencies, multiple dogs can be problematic, too, especially if they encourage bad behavior in each other. Never allow dogs to be alone together without your supervision until you're 100 percent sure they get along fine. Although dogs often get along swimmingly when owners get them at the same time, things can be rocky when a new dog is introduced to an existing dog. Territorial and possessive behavior could ensue.